Ireland, Iceland, now Cyprus—the story of small countries with oversized banking systems is all too familiar. There is never a shortage of commentary when a crisis erupts, but much of it assumes a working knowledge of financial terms and concepts. General readers are left wondering—What is a haircut? What is the difference between a bailout and a bail-in? Who wins and who loses when the government steps in to rescue a failed bank? I know the feeling behind these questions. It is the same as I get when I go to an opera sung in an unfamiliar language. If you are among those who ask such questions, what you need are some program notes to help you understand the Cyprus drama, and by extension, other banking crises like it. Act 1, Scene 1. How can we tell if a bank has failed? System-wide banking crises like that in Cyprus always begin with the failure of individual banks. In principle, it ought to be easy to tell when a bank has failed. In practice, that is not always the case. Let’s start with the simplified balance sheet of a representative bank. The bank’s assets include all the things of value that it owns. This bank has $50 worth of reserves in the form of deposits at the central bank, currency in its ATM machines, and other items that we loosely refer to as “cash.” Next come loans to consumers and businesses, which are the largest item for most banks, $600 in this case. The bank also holds securities, such as government bonds or mortgage backed securities, worth $350 dollars. A real bank balance sheet would have other smaller items, including buildings and business equipment. The bank’ liabilities include all the things it owes to others. Deposits are the biggest category for most banks. Banks also borrow funds from other creditors, for example, by selling bonds and through short-term interbank markets. Some of this borrowing is secured by specific collateral and some is unsecured. We define the bank’s capital, which represents the shareholders’ stake in the bank, as total assets minus total liabilities. Businesses like industrial corporations or retail stores often have capital equal to half or more of their assets. This bank has capital equal to just 10 percent of assets, which is typical of the banking sector. We say that a bank with a low ratio of capital to assets has a high degree of leverage. It is clear from these definitions that any loss in value of the bank’s assets, while its liabilities remain unchanged, will reduce a bank’s capital. The most common reasons for a loss of asset value are failure of borrowers to repay loans in full (credit risk) and decreases in the market price of securities the bank owns (market risk). If the losses are big enough, capital falls to zero or below, and the bank fails. The technical term for bank failure is insolvency. In the case of Cyprus, banks’ biggest losses came from investments in Greek government bonds, which lost value as the Greek government struggled with its own financial crisis. The following before-and-after balance sheets show what happens to our simplified bank when the securities it holds fall in value by $100. (Items that change are shown in color.) After the loss, the bank’s assets have fallen to just $900 while its liabilities of $900 remain unchanged. Its capital—assets minus liabilities—has fallen to zero. It is insolvent. In practice, it is not always easy to tell whether a bank is solvent or not just by looking at its balance sheet. There are two main reasons for this. First, not all bank assets are marked to market. That means that the book value that the assets are given on the balance sheet does not always reflect the value at which they could be sold. For these reasons regulators are often the last to declare that banks have failed, even long after the fact is apparent to everyone else. That is exactly what has happened in the case of Cyprus. By any common sense measure, they are insolvent, but as of this writing, the European Central Bank (ECB) has not yet officially declared that to be the case. A loss of asset value is always the proximate cause of bank failure, but bank runs can be a contributing cause. The classic form of bank run occurs when depositors line up to withdraw their money from a bank because they fear it will become insolvent. Sometimes, as in the case of Cyprus, regulators try to stop a run by temporarily closing the banks, but even when the banks were closed, Cypriots drained every euro they could out of their ATMs. Runs are not always limited to depositors. They can also take the form of a refusal by non-deposit creditors to renew the bank’s short-term borrowing. For example, other banks may cut off interbank loans to a bank that looks at risk of failure. If a bank had unlimited reserves of cash or if it could always sell its loans and securities at the full value listed on its books, a run could not cause insolvency. It would simply reduce liabilities and assets by equal amounts, leaving capital unchanged. However, not all of a bank’s assets are fully liquid, that is, capable of being converted to cash at their full value on short notice. What often happens is that a bank faced by a run quickly exhausts its reserves of cash. After that it may be forced to sell assets at “fire sale prices.” Remember, the assets are not marked to market, so that the price they bring from a quick sale may be well below what they would be worth if the bank could hold them until they mature. When a run forces a bank to sell assets for less than their book values, total assets fall by more than liabilities, and capital quickly falls toward zero. The next set of before-and-after balance sheets illustrates how a run can cause an apparently solvent bank to fail. In this case, imagine that depositors suddenly withdraw $300. The bank meets the first $50 of withdrawals out of its cash reserves. When those are gone, it tries to sell some of its securities. However, when it tries to sell them on short notice, perhaps at a time when the market is nervous because other banks are also threatened with failure, it has to accept fire-sale prices. In this case, we assume that it needs to sell all of its securities, previously valued at $350, to gain the remaining $250 it needs to pay to depositors. In the end, although the bank’s liabilities fall by just $300, the value of its assets fall by $400 and it becomes insolvent. If regulators permit it, an insolvent bank may manage to stay open at least for a time. The ECB has allowed that in the case of the insolvent banks of Cyprus, at least for the time being. However, insolvent but operating banks, sometimes called “zombie banks,” are dangerous. Since their shareholders no longer have any capital to lose, they may be tempted to take extreme risks in the hope of restoring solvency. In other cases, seeing that the end is near, owners or managers may simply steal the bank’s remaining assets and disappear. Even if managers act in good faith, as long as the banks stay open, their losses are likely to continue. As their capital falls farther into negative territory, any eventual restructuring becomes more and more costly. In short, good regulatory practice dictates that insolvent banks not be allowed to continue operations. Suppose regulators decide to follow good practice and liquidate a failed bank. We can see how this works by continuing our earlier example, starting from the last balance sheet shown above. Liquidation means selling remaining assets for whatever they will bring and then distributing the proceeds of the sale among those with claims against the bank. In this case, the bank’s remaining assets consist of loans with a book value of $600, but since the loans are not marked to market, so it may not be possible to sell them for that much. Suppose that when regulators sell them as part of the liquidation process, the best price they can get is $500. They must then decide who gets the money. Normally, liquidation gives highest priority to depositors. In this case, sale of the loans produces enough cash to pay off the remaining $400 of depositors’ claims in full. The next highest priority goes to other creditors, who have $200 in claims. Since there is only $100 left after paying off depositors, those non-deposit creditors get just 50 cents on the dollar. In financial slang, they are said to receive a haircut of 50 percent. In practice, assignment of haircuts is complicated by the fact that some of the bank’s borrowing is usually secured by claims on specific collateral like government securities. The secured creditors are legally beyond the reach of haircuts. Suppose, for example, that the $200 of borrowing of our simplified bank consisted of $75 of secured borrowing and $125 of unsecured borrowing. The secured creditors would get their full $75. Distributing the remaining $25 among the unsecured creditors would then amount to a haircut of 80 percent on their $125 of claims. Some banks, including those in Cyprus, have very little by way of unsecured borrowing. Their liabilities consist almost entirely of deposits. In such a case, liquidation could easily not realize enough cash to pay depositors in full, so they, too, may be subject to haircuts. That is exactly what EU authorities initially recommended for Cyprus: Large depositors were supposed to take a 9.9 percent haircut, and small depositors a haircut of 6.75 percent. Cypriots were furious. Wealthy Russians, who have a lot of money deposited in the banks of Cyprus and a lot of behind-the-scenes clout in its parliament, were even more furious. Even the President of Russia, Vladimir Putin, jumped into the fray, calling the proposed restructuring plan “unfair and unprofessional.” Even after the plan was changed to protect small depositors, the Cypriot parliament rejected the proposed haircut, deepening the crisis. In practice, regulators do not always liquidate insolvent banks. They are especially likely to avoid liquidation if they think a bank is too big to fail (TBTF). They may see a bank as TBTF because of a fear of financial contagion, for example, the fear that failure of a large bank might start a panic that would damage the whole financial system or might cut off a vital source of credit for nonfinancial businesses. In other cases, the perception of TBTF may reflect political capture of the regulators by banks, though cronyism, a revolving door of appointments between bankers and regulators, campaign contributions, or other forms of corruption. If, for whatever reason, regulators think a bank is TBTF, they must carry out some kind of restructuring that will restore it to solvency. Several tools are available to do this. The simplest tool is to loan the bank some cash. Such a loan can give the bank time to sell off assets at better prices and to shrink its balance sheet to a manageable size. If the loan is made at a below-market interest rate, it may help stem losses or even make the bank profitable again. As the crisis in Cyprus deepened, the ECB continued to make loans to the country’s troubled banks. That is one of the reasons it refrained from declaring those banks insolvent, since its charter permits it to loan money only to banks that are solvent, or that it can at least pretend are solvent. Knowledge that the government stands ready to act as lender of last resort to the bank may be enough to stop a run. However, because the immediate effect of a loan is to raise liabilities and assets by the same amount, it does not immediately increase a bank’s capital. For that reason, although loans can help weak banks that face temporary liquidity problems, they are not by themselves enough to save banks that are already deeply insolvent. A more powerful tool of bank restructuring is for regulators to exchange some of the bank’s bad assets for good assets supplied by the government. For example, suppose the bank holds securities backed by subprime mortgages that have a face value of $100 million, but a market value of only $50 million. Swapping the mortgage-backed securities for $100 million of safe government bonds would add $50 million to the bank’s capital. This kind of asset swap is sometimes called a carve-out. Regulators then move the bad assets to the balance sheet of some agency that has the job of selling them or managing them to extract as much value as possible. Such an agency sometimes goes by the colorful name of a bad bank. Another powerful tool of restructuring is to supply cash or safe government bonds to the bank in exchange for shares of stock. Such an operation, which increases the bank’s capital even more directly than a carve-out, is called a capital injection. Sufficiently large capital injections or carve-outs can bring even the most troubled bank back to solvency, but they can be very costly. In the case of Cyprus, the cost of the rescue plan proposed by EU authorities was roughly 40 percent of the country’s GDP. When regulators rescue an insolvent bank, they must not only decide what tools to use, but who will bear the cost. The first question is what to do about a bank’s shareholders. One possibility is a full nationalization of the bank that wipes out the original shareholders altogether. The government can then use a carve-out or capital injection, or both in combination, to restore the nationalized bank to solvency, and eventually reprivatize it. At the other extreme, the government may use a combination of loans and carve-outs that leave the shareholders in place as owners of a newly solvent and profitable bank. It is that kind of restructuring that most accurately deserves the term bailout. In between, the government may decide to recapitalize the bank through an issue of new shares that leaves the original shareholders in place but dilutes their stake in the bank’s capital. Such a case, where shareholders suffer losses but are not fully wiped out, amounts to a partial bailout. The next question is what happens to the bank’s unsecured creditors. As explained above, if a bank’s capital falls below zero, a simple liquidation will result in losses (haircuts) for unsecured creditors. However, restructuring through a carve-out or capital injection may leave unsecured creditors untouched, bailing them out in full even when shareholders suffer losses. Bailouts of bank shareholders and unsecured creditors are not popular. They are often an object of popular protest, and equally, of criticism by financial specialists. Both ethical and practical reasons lie behind the unpopularity of bailouts. The ethical case against bailouts rests on the notion that shareholders and bank creditors are grown-ups. They willingly put their money at risk by investing it in banks that they should have seen, through due diligence, to be far from risk free. If the gamble of buying shares in a shaky bank or making unsecured loans to it pays off, investors expect to keep their profits. Accordingly, if the gamble does not pay off, it is only just that they should take their losses. To avoid the ethical and practical problems of bailouts, regulators may insist that unsecured creditors, as well as shareholders, take haircuts as a condition of the restructuring. Our earlier example showed how haircuts work for a bank that is being liquidated. When the bank is being restructured instead of liquidated, the same logic applies. Every dollar of haircut that creditors are subject to means one less dollar that regulators must inject into the bank to restore its capital to an adequate level. For example, suppose a bank has $200 million in unsecured borrowing and needs $100 million in capital to become adequately solvent. Regulators might agree to inject $50 million of government funds into the bank on the condition that creditors agree to a 25 percent haircut. The haircut reduces the value of the bank’s liabilities by $50 million, so that the combined effect of the haircut and the capital injection is to increase the bank’s capital by the necessary $100 million. Such an arrangement makes the unsecured creditors partners in the government’s recapitalization efforts rather than beneficiaries of it. For that reason, it has come to be called a bail-in of unsecured creditors, to distinguish it from a bailout, in which creditors benefit from the restructuring without being called on to make any contribution to it. What about depositors? Most countries protect small depositors through deposit insurance. For example, the Federal Deposit Insurance Corporation in the United States protects deposits up to $250,000 per depositor per bank. A much more controversial issue is whether large depositors, too, should receive full protection. U.S. regulators extended unlimited insurance protection, for a time, during the financial crisis. In contrast, in the case of Cyprus, authorities of the European Union initially insisted that not only large depositors, but small ones, be bailed in. I am writing this post in the intermission before the final act of the Cypus banking opera, so detailed program notes will have to wait. However, it is worth calling attention to two general principles regarding bank failures and restructuring that will shape the way things will unfold in that country. Banking losses are real losses. The first principle is that banking losses are real losses. It is easy to forget that. Descriptions of bank crises often focus on exotic financial instruments like collateralized debt obligations and credit default swaps. Some people see decreases in the value of such instruments as “only paper losses.” It seems them that it should be possible to erase all that “funny money” though some kind of accounting trick without touching the real economy. Unfortunately, that is not how things work. Although some kinds of financial losses may net out against one another, when the dust settles, we find that there are real losses behind all the paper. For example, behind the 2008 financial crisis in the United States, Ireland, Spain and several other countries there were wild overinvestments in real estate. Houses and condos were built that no one wanted to buy, at least not for enough to pay for the bricks and the wages of the bricklayers. In Cyprus, funds supplied by bank depositors were used to buy Greek government bonds, which, in turn, were used to pay the salaries of Greek bureaucrats to do work that critics claim was unproductive and overpaid. There is no way to recapture that wasted labor now..
Because banking losses are real losses, someone always ends up bearing them. The only question is who. One insolvent sector cannot bail out another. The game of bailout and bail-in is a matter of deciding who bears the losses of bank failure. Unfortunately, the game has a fundamental rule that one insolvent sector cannot bail out another. For example, life would be easier if all of the losses of failed banks could be loaded on the shoulders of shareholders. Unfortunately, shareholders can bear losses only to the extent of the capital that they have at risk. If a bank were liquidated at the exact moment its capital dropped to zero, then yes, the shareholders would be the only ones hurt. In practice, however, a bank’s capital is often far below zero before it becomes obvious that it has failed. In that case, losses exceed the investment made by shareholders, so someone else must be bailed in. Creditors, large depositors, and even small depositors are among those in line for haircuts when a deeply insolvent bank is restructured. Often, however, some or all of those parties are politically powerful enough to avoid bearing their fair share of the costs. When that happens, the country’s taxpayers are the ones who pay. The government issues bonds to fund its bailout and taxpayers bear the burden of the interest and principal for years to come. In some cases, even the country’s government is insolvent. It lacks either the power or the will to sell the bonds or levy the taxes that would be needed for a complete restructuring. Sometimes that leads to a chaotic outcome. For example, when a banking crisis hit Russia in 1997, the government largely stood aside. Banks simply collapsed, leaving individual depositors and many businesses with huge losses and incapable, for a time, of making any but the simplest cash payments to one another. Meanwhile bank insiders stole billions of rubles, sticking small depositors and poorly connected creditors with huge losses. It is ironic that Russia, always sensitive to others’ interference in its own domestic affairs, is now offering unsolicited advice to EU and Cypriot authorities on the proper way to conduct a bank restructuring. Iceland provides another example of a country that could not afford to restructure its banking system, which at one time had assets more than ten times larger than the country’s GDP. When several of the largest banks failed in 2008, the government was not able to do more than offer limited protection to domestic depositors. Foreign depositors and other creditors were left to fend for themselves. The situation was not accompanied by the degree of corruption and criminality that Russia saw in 1997, but it deeply shook the Icelandic economy and left a legacy of bitter diplomatic disputes. In Cyprus, the situation is still touch and go. One thing is sure: The total losses of Cyprus banks exceed the resources of the country’s government. If it tried to absorb the cost of a full bailout, government debt would rise to unsustainable levels approaching 200 percent of GDP. The Cypriot government has sought outside aid from the EU, the IMF, even Russia, but it may be some time before it is clear where the ultimate losses fall. For a followup, see Further Program Notes on the Cyprus Banking Drama. For more details on bailouts and bail-ins, see this tutorial on bank failures and bank rescues. I think Russian crisis of 1998 is an interesting example, and not 100% negative one. Allowing banking system to collapse (to be fair, Sberbank was still around and it had majority of deposits at the time and Government had no legal obligations to protect depositors on other banks) in my view was one of the reasons for unprecedented growth that followed few years later – example of Japan few decades earlier or most of Western countries in current crisis shows that bailing out the banks may be one of the reasons for prolonged crisis. Igor– I agree, letting the banks collapse rather than save them was probably a good idea, but the way the value remaining on their balance sheets was distributed stood all notions of orderly bankruptcy on their head. In effect, the pattern of splitting the balance sheets into good banks and bad bans was followed, but in this case, it was insiders who ended up as beneficial owners of the good banks while ordinary depositors, and to some extent also the tax authorities, ended up with the bad parts of the banks. At any rate, that was the impression I got at the time, viewing from ground level in Moscow. Ed- I agree on Russia (having being actively involved in restructurings on behalf of international bank post 1998 crisis I have no illusions about it)- however despite all said non-intervention by the state led (in conjunction with other factors) to a decade of unprecedented growth unlike the bail outs that led to a long term recessions. Going back to Cyprus, Ireland and other recent cases I think if the governments will stick to their legal obligations i.e. pay depositors under 100k or whatever is agreed in their specific deposit guarantee), place the bank in an ordinary liquidation (not to be confused with nationalisation), put everybody (including unguaranteed deposits over 100k, bank lenders, counterparts of all different types etc. ), allow administrator to sell branches etc. it would likely be much better outcome. Unlike Russia in 1998 these countries proud themselves with rule of law-undermining this principal is far more dangerous than anything else. This is a good discussion of the principles of domestic banking. It is relevant to whether the Central Bank of Cyprus might bailout insolvent Cypriot banks. However, the current crisis in Cyprus is important because it may affect 17 countries of the Eurozone and possibly others. An important question is whether the residents of one country (for example, Germany) should bailout banks in another country (Cyprus). In terms of the explicit rules stated when the Euro was introduced, the answer was clearly no. No member country was obliged to bailout any other member. Since the "no bailout" provision was ignored when Greece and others were bailed out, why not bailout Cyprus also? After abandoning its early rules, the Eurozone lacks clear principles to guide its policies. What underlying principles could lead the European Central Bank to propose taxing deposits at Cypriot banks that were covered by deposit insurance? We wait for the next act of the drama. Great explanation Ed, that's one to save for explanations in future crises. We might add two more complications for the "Island Nations" disease. a. No bail-out conducted by a country can exceed the entire real output or entire real asset base of the country. In practice, a country's bail-out power cannot exceed the non-survival surplus. b. If the economy of a country consists almost entirely of taking deposits from foreign parties and then investing in other foreign parties, an eventual disaster is to be expected. There are some things I don't understand about the Island disease. For example, why do Bahamas, Monaco, Cayman Islands, etc. not fall victim to this problem? They also have outsized banking systems. Is there something different about them, or are they just the next dominoes waiting to fall? that most people think have sound banking systems. I agree that deposits/GDP is not an indicator of bank health. However, it does indicate something about the options that are open to a government in dealing with a systemic banking crisis. If the system is relatively small, the government has the option of recapitalizing it out of taxpayer funds. If it is large, as in Iceland or Cyprus, that option is not there. Either no recapitalization or the funds have to come from outside. Ireland is the borderline case. My guess is due to these island banks being mere conduits and not actors. Most well heeled depositors allow these conduit banks to make the credit or market risk decisions. It appears as though these other island allowed the bankers some level of agent power and that led to their demise, real or potential. sorry: Most well heeled depositors DO NOT allow these conduit banks to make the credit or market risk decisions. Edd, isn't it surprising that even in the biggest countries the banks balance sheets and activities exceed several times the GDP. Isn't time to try to rethink the question, "who is in charge? ", the banks or the government. Yes the governments have done a very lousy job in the past. But the banks did not do any better. For example, how could they give so much credit to Greece? Wasn't it obvious that economy sized at most 250 billion cannot repay loans above 500 billion? Or some economic models could be as much misleading? Maybe it is time to nationalize the Money. Isn't sovereignty about the right to control the money. And suddenly all the governments gave up their sovereignty of creating money in favor of the banks. I am not surprised there are again voices for restoration of gold standard. At least with it the right for money creation would be transfered to some ex-anthropic force. This is a very clear explanation. In Slovenia we have very similar problem with the biggest (system) banks being loaded with bad loans, fortunately not even close to the GDP. Although the state is a majority owner, I agree with Igor Zax that allowing an orderly bank collapse would be preffered to the various options of the bail-out. With the collapse we at least ensure that crony bankers and insiders get sacked and at least a fair chance that a different system will be put in place. In addition, why create a new "bad bank"? In such extreme cases, would it not be easier to create a "good bank" where deposits and good assets would be transfered, with a government capital injection if needed? I see the biggest problem of "bad bank" in valuation of the real value of bad loans/assets. With "good bank" there is no need for this and only classification of good loand/assets is needed, which is already established. Here is a simplified example of how I understand the good bank/bad bank procedure. There are variations; anyone out there with more detailed knowledge please correct or add to my example. Suppose your bank has good assets worth $1000, bad assets with face value of $1000 but market value of $500, insured deposits of $800 and other liabilities, including uninsured deposits, of $1000. The bank has negative capital of $300 at market value, so the government decides to liquidate it. First it takes the whole balance sheet of the bank in trusteeship, leaving the shareholders with no remaining claims. Second it creates a new balance sheet for the "good bank" and puts the insured deposits there along with the good assets. The good bank now has capital of +$200. The government privatizes this bank by auctioning it off, the buyer probably being an existing healthy bank, but it could float a new share issue and make the good bank a new, free-standing institution. Third, it takes the remaining assets and puts them on a balance sheet it calls the "bad bank." The bad bank also gets the uninsured deposits and other unsecured liabilities. This entity still has negative net worth, so it stays in trusteeship of the government until the bad assets can be disposed of in a way that realizes the maximum value. That may take time; dumping them on the market in the middle of a crisis may not be the best solution. What happens to the deposits and other liabilities? They can simply be frozen until the bank is liquidated and then paid out with an appropriate haircut, or they can be converted into equity in the bad bank, with the depositors eventually collecting the residual value of the bad assets after management fees. One way to look at it is to think of the depositors and other creditors of the bad bank as the involuntary shareholders in a sort of investment fund. Anyhow, that is how I understand the process. Can anyone out there correct me if I an wrong? "The deposit guarantee should be triggered and therefore $800 of deposits should be repaid by the government (regardless of what happens with the bank." Well, yes, but the question is how to make good on the guarantee? You could liquidate the bank and send all depositors a check in the mail, you could arrange a merger, in which case the depositors would only notice a change in the name on their statements, or you could make a new "good bank" (sometimes called a Phoenix bank in US parlance) that has adequate good assets to support the deposits and transfer the deposits to that. It all comes out the same, but the latter two are often better than a cash payout. "textbook" comes to mind. however we're only "scratching the surface" on this wonderful "recital." first off is the question of TIMING. Unlike the collapse in Russia or the USA this event has been "timed." this is a MAJOR problem in my view. it also appears to be TARGETED as well. YIKES. "this is the exact opposite of confidence inspiring"…indeed it seems rather AWE inspiring. third…and STILL leaving aside the question of motivation is question of "result." Clearly the USA in 2008 was surprised at the scope and severity of the crisis…"they were in the dark" as they say. So Bear Stearns said things were bad…"okay…you go to the Morgue." Lehman said "we're fine"…fine…ooops…in fact you're a catastrophe…goodbye. "aha! now we know we have a huge crisis." i was unaware of any problems in Cyprus until suddenly "someone released the hounds." i know of no plan that involves "taxing depositors directly" that involves "saving a bank." Spain has already done this via "giving the savers the equity in the bank" now goodbye. EEEKS! The ONLY question that can come to mind given this textbook presentation is therefore "was this intentional?" i mean no one in their right mind would do this "to save the bank." indeed simply "letting it fail" is not being done here either. it appears we have "you will now be failed" which begs the question "if this is true who is doing this and why?" (good luck answering the who part.) the "why" seems to me to be "the sudden return of national currencies." i really don't see any other "why" here. this has NOTHING to do with banking and EVERYTHING to do with "the money." VERBOTEN. forget the banks…how do i "recapitalize a country"? anywho in the USA we had TARP and TALF and QE and the zero bound rate policy, deposit insurance, backstopping of banks through direct loans, etc..etc…etc. THAT is how you do a "bank rescue." THIS is how you do "a bank failure." "Which begs (sic) the question "if this is true who is doing this and why?" Ed, your analysis is all about the past. You yourself rightly wrote "Banking losses are real losses. The first principle is that banking losses are real losses. It is easy to forget that…..". Yes, the banks activity influenced the real economy, by allocating wrongly the economic resources. But what about their future activity? Are the banks going to be managed with self appointed managers driven by short term policy of self enrichment? Since banks are the real money managers in the economy, they are also the major resources allocators, (not the governments as someone may think). The question for the future are; Who will manages the money. 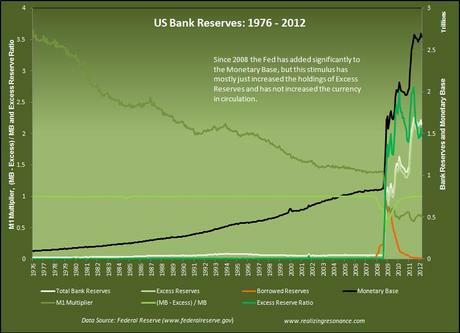 Are the banks really the most effective tool for the allocation of Money and with it the resources? Is this the best way to utilize Money to the economic benefit of the entire society? Are we always right to assume that the allocation of Money to economically the strongest and most capable entities will necessarily create the highest added value for the economy and the society as a whole? Maybe the existing system is just a system discriminating new entrepreneurs, who are the ones with greater potential for creating new and better economic values than the established entities? Your concerns about the future are well founded. It is true that we cannot automatically assume that banks will allocate capital to the best uses. However, keep in mind that the past influences the future. When a bank fails, we cannot just say, "oh well, that was the past. Let bygones be bygones." The biggest problem is when bank failures are resolved in a way that does not impose losses on parties who took undue risks and made bad decisions, cheap capital will continue to flow to poorly managed banks. Those banks will grow larger until they become TBTF, and then their future ability to allocate capital will be even more in doubt. Very much so. There is no punishment for banko-kleptoism. 1. Exaggerated personal rewards to the bank managers based on short term performance, with no correlation between reward and the more important long-term performance. 2. Tendency to shift credit from financing investments to financing consumption. While credit channelled to investments in new economic ventures and increased Product production capacity is sustainable in the long run, excessive consumer credit if overdone is not. The focus of bank activities on consumer credit has encouraged unrestrained prodigal consumerism, which in itself cannot create potential economic added value and so secure the loan principal and interest repayments. The practice of basing assumptions of ability to repay on the borrower’s existing income and premises led to over-extension of the liabilities of the private household, which in times of crisis, unemployment and economic uncertainty not only caused economic misery to the credit-exposed individuals or businesses, but damaged the banks’ performance too. Above all this practice reduces the purchasing power of the society as whole at times of deflation, exactly when the opposite is most needed. 3. Allocation of financial resources to purchase the sovereign debts of governments in Europe and other regions in the world which had accumulated irresponsibly high debts clearly in excess of their ability to repay. This not only brought the world financial system to brink of collapse, but also channelled financial resources into very bad forms of utilization. These finances could have been used for infrastructure projects in less developed regions, where lack of infrastructure is a major bottleneck preventing economic growth, and so every effective infrastructure project brings relatively high economic rewards. Instead the finances were used for big white-elephant projects with no economic justification, which probably enriched certain individuals but not the bank owners, and even less society as a whole. 4. Over-concentration on real estate financing. This created property bubbles which eventually had to burst because residential prices were inflated beyond the point where people with average incomes could reasonably afford to purchase property. Ordinary people ended up taking on liabilities exceeding their repayment capacity. 5. The banks have become the major contributor to all kinds of financial bubbles, and are the major cause of economic ups and downs. Because of its principle of leveraging the small deposits of widely spread depositors into a big volume of credit, the commercial banks’ activity encourages the boom-bust cycle. The volume of bank credit grows when the economy is prosperous or bullish, and shrinks when it seems to be is in crisis or bearish. This means that banks act exactly opposite to the needs of stable economy. Thank you. One of the better articles I've read online since I started to wrap my head around the 'crisis' in '07.